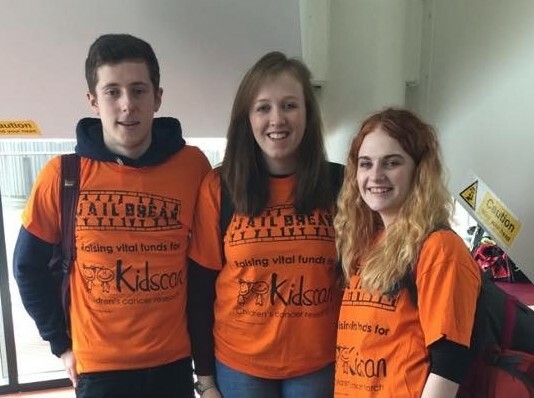 A student from the University of York, who survived childhood cancer at age 12, made it to Sweden as part of a Jailbreak event for children’s cancer research charity, Kidscan. The aim of Jailbreak is to travel as far as possible in 30 hours without spending any money. Team ‘The Passengers’ consisted of students Sophia Steinsberg, Scott Wilson, and Elsie Hargate, who managed to reach Stockholm, Sweden, and raised £2,428 of the £12,019 attracted by the event. Sophia, who is studying for a degree in Theatre and Performance at York, was herself diagnosed with osteosarcoma, a rare type of childhood bone cancer, when she was twelve years old. Having spent a year in hospital, and following two operations and 10 months of chemotherapy, Sophia was given the all-clear. Salford-based Kidscan has been instrumental in the funding of a range of groundbreaking research projects, with the sole purpose of providing new and improved treatments for children with cancer. Anyone inspired by the Jailbreak students can still donate through the team’s JustGiving page at www.justgiving.com/sepyorkjailbreak. For more information on Kidscan, please visit www.kidscan.org.uk or call 0161 295 3864.